Well I woke up on Tuesday morning feeling like a brand new person. So good, really, that it made me realise I hadn’t been quite right the day before either. Feeling refreshed, I got up and deciding to skip the enormous (and therefore tempting) buffet breakfast (you’ll understand why in a minute), and just headed to Starbucks for a coffee. Everywhere here seems to serve coffee with milk or espresso and no long black coffees. I’m sure they do, I just haven’t worked out how to ask for it. 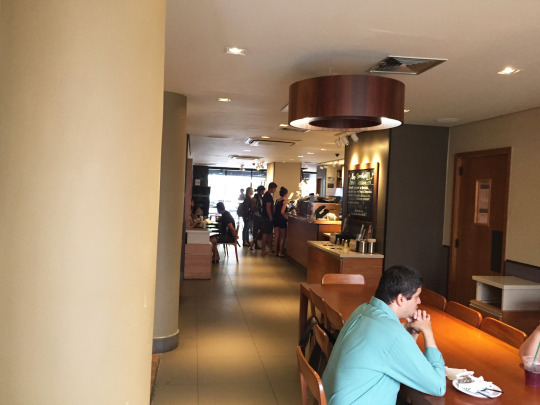 So that’s why I went to Starbucks – this one just under a ten minute stroll from my hotel. As you can see from the picture, it’s definitely nothing special! It has a permanent security guard by the door, but also it has these…. There’s a Brazilian restaurant in Dallas my family and I (note the grammar there Dad) sometimes go to, so I recognised these straight away. They’re little cheesy bread rolls – although they’re made with a special kind of flour which makes them kind of chewy and delicious. 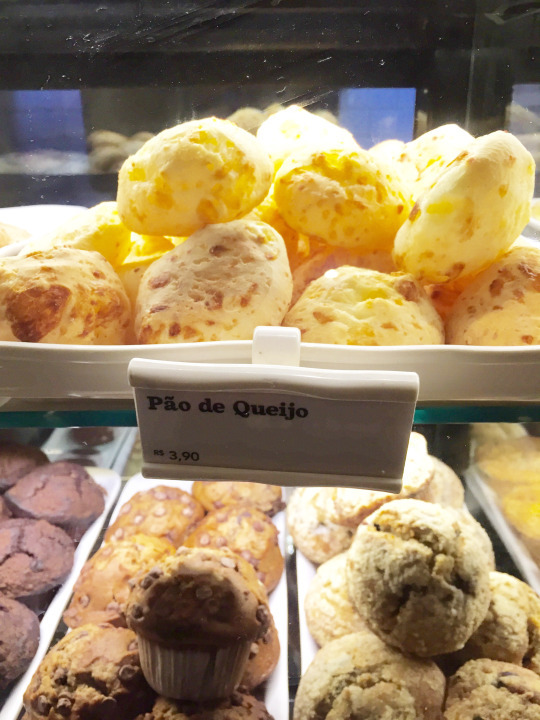 In Brazil they’re a common breakfast food apparently, so obviously I had to have one – heated! It was just the right size for a wee bite in the morning. 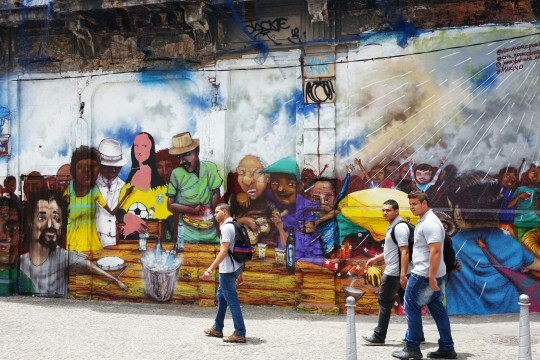 After sitting there and writing yesterday’s blog, I headed back to the hotel and hailed a taxi to Lapa – an area quite near Santa Teresa, where I started my trip to Rio. 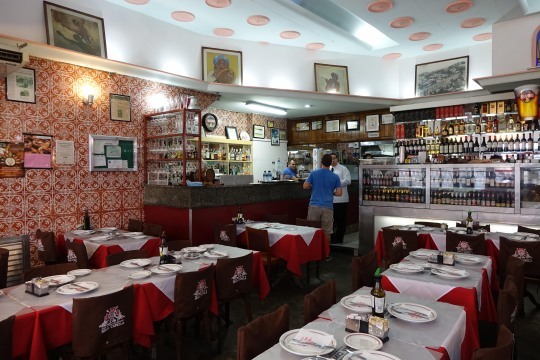 It was about 11.30 and I headed straight to a restaurant – a meeting point for the food tour I was going to spend the day doing. It was a pretty cool place – like stepping back in time, and apparently it’s kind of been left untouched since the sixties. 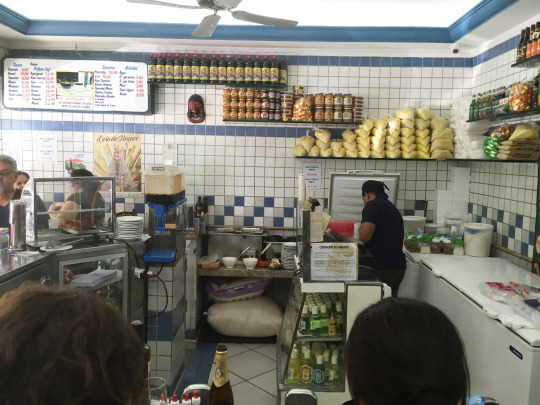 I was there to take part in an Eat Rio Food Tour – something I’d booked long before I’d left Belfast. I’d found it on Trip Advisor, where it gets rave reviews, and I’ve got to say having done it now I can understand why! We were met by our guide Tom, who’s originally from England. 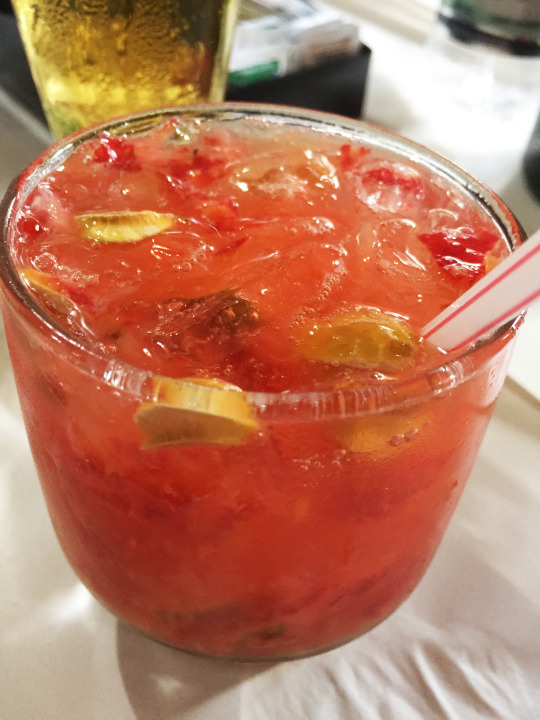 After a quick snack and drink, we headed out in to the heat, and took a stroll through the streets of Lapa. Although I’d set foot in the area before, when I visited the tiled staircase, I hadn’t really wandered much further. Everyone just kind of seems to take it for granted! Every house and building is covered in graffiti or a mural (some of it better than others). 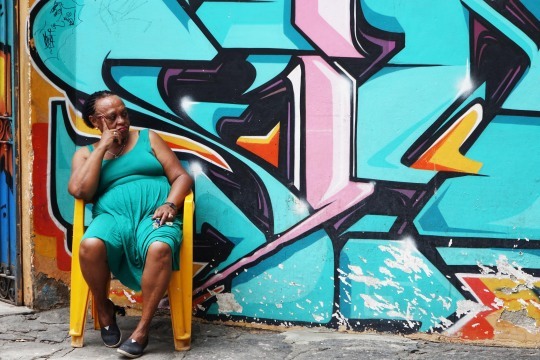 Walking around, for the first time I felt like I was actually seeing the real side to Rio – people just going about their every day business, school kids on their lunch break, everyone just getting on with life. Straight away that made the tour seem like a really good idea – in less than an hour I was getting away from the tourist traps and going places I wouldn’t have gone otherwise. I’m not going to go into too much detail about the places we stopped on the tour, as I don’t want to give anything away for people reading this that might do the tour at some point, also I don’t think it’s fair. So (missing out some bits here) we ended up at a food market. It was very different from a food market at home. Yeah that’s raw chicken just sitting out in the heat. Not sure about that really. 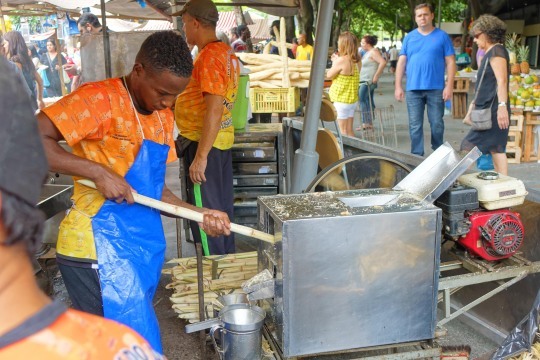 Tom took us around the stalls, let us sample some more snacks, and showed us a stall where they make raw sugar cane juice. The machine looked lethal! 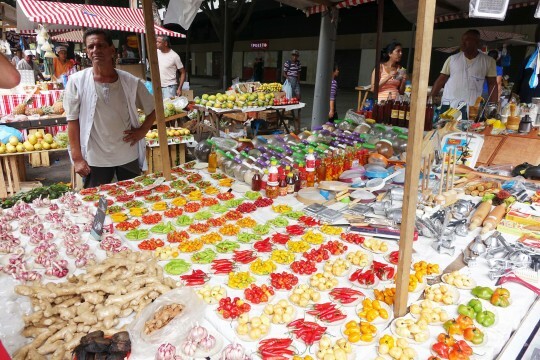 After that we sampled some fruit, and it was all stuff I’d never seen before, never mind tasted. There was only one that got an almost unanimous thumbs down – a cashew apple (it’s what cashew nuts grow from). It was absolutely revolting. It was like spongy tongue. 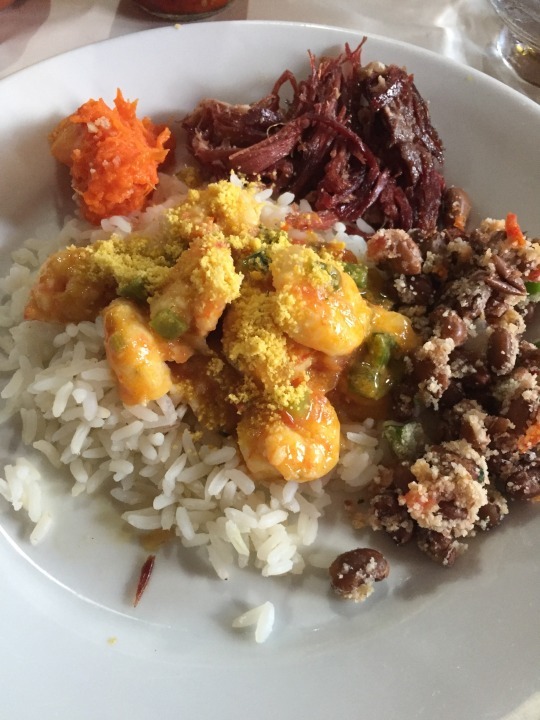 Coming out of the market, we headed to a tiny restaurant where Tom told us we’d get a taste of Amazonian food. Again, it was someplace I wouldn’t even think of stepping into or visiting, but it’s well known in the city for being authentic. 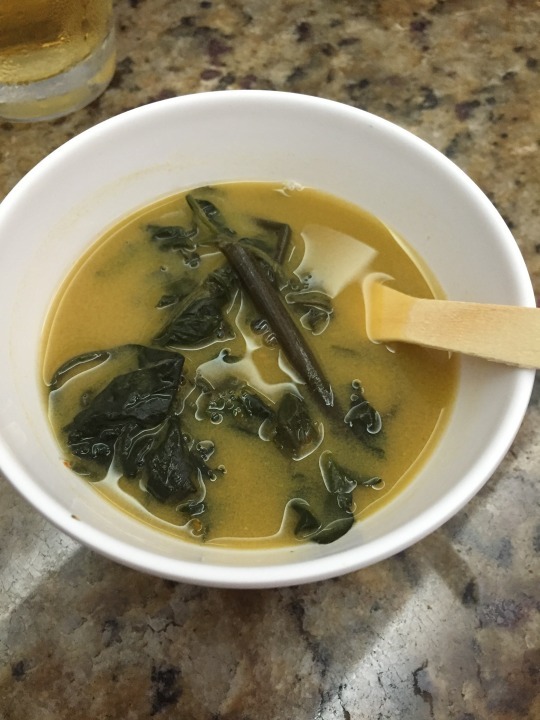 We had a bowl of soup, which I thought was delicious. It had a leaf in it which really makes your mouth tingle, which was a very weird but not unpleasant experience! Looks harmless, but it isn’t! (Well it is really but it’ll make your mouth tingle). After we stopped in a little square for some more fruit and a very strong spirit that made your whole mouth tingle (again, must be an Amazonian thing) we headed to our final stop of the day. A really nice restaurant. I had one of these, and immediately felt tipsy. The restaurant had made it with fruit Tom had purchased from the market, which i thought was really cool. Then over some beers and chat, we all sat down to the final meal of the day. I’d really loved the tour – everyone else was really pleasant, and it was a really fun but informative way to spent the afternoon (actually a bit longer than that). Tom was very funny, and also just seemed to genuinely want to help people see the places in Rio tourists don’t usually bother going to see. He also asked if anyone needed any tips on anything which was really handy (see tomorrow’s blog). Finally, in another first – and something I should have done ages ago but didn’t) I took the Metro! I’d been under the impression that it didn’t go a) anywhere near my hotel and b) anywhere you’d want to go. Both of these turned out to be untrue. It’s cheap – at about 50p a trip, and you can go far. 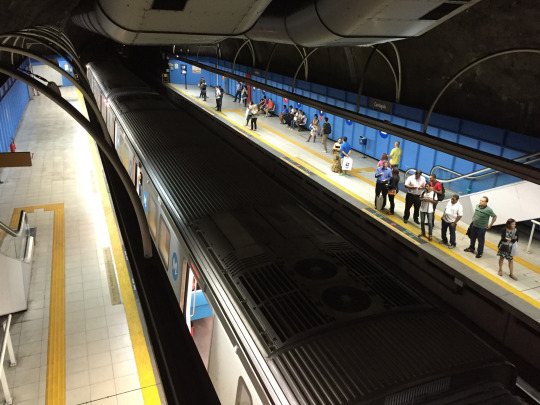 So that’s the first thing I’d recommend about Rio – check out the metro. 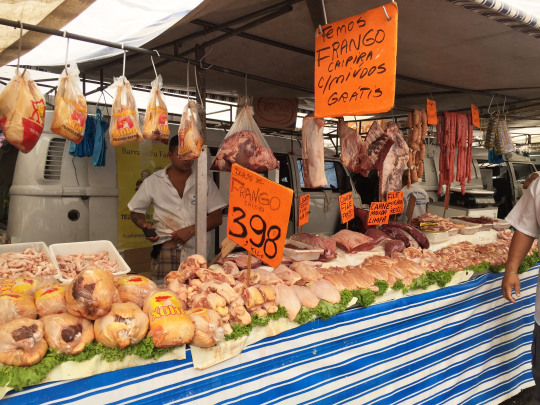 Secondly, is do the Eat Rio Food Tour – seriously – even if you’re not into food, you’ll get a lot out of it. But do it early on in your stay, as you’ll learn stuff you wish you’d known when you arrived (like me). Obviously no need for any kind of dinner last night, so I downloaded another episode of River (I love it) and then headed to bed.